Mr. Jacob Meldgaard has been the Chief Executive Officer and Executive Director of TORM since 1 April 2010. Mr. Meldgaard has a Bachelor of Commerce degree in International Trade from Copenhagen Business School, and has completed a management programme at INSEAD in France. He also has different advanced management programmes from Wharton Business School, Philadelphia in 2006 and from Harvard Business School, Boston in 2009. Prior to joining TORM, Mr. Meldgaard has been Executive Vice President of Norden A/S until September 2008. Before this, he has been Senior Vice President and Head of Dry Cargo Department from 2004 to 2008 and served as General Manager from January 2002 in Norden A/S. 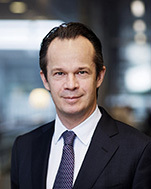 He joined Norden in 1997 after he served at J. Lauritzen A/S for two years. He started his career in shipping at A.P. M�ller in 1990, where he received his shipping training.